The first image of Halle Berry as Catwoman has been released by Warner Bros. The image appears in this week's Time Magazine as well as Access Hollywood on Monday. Click on the thumbnail for a larger image and look for more Catwoman news soon here in The Continuum. "Wages of Sin," a new episode of Mutant X is scheduled to air in syndication the week of Oct. 6. "The Mutant X team must stop the auction of a highly lethal substance that a number of notorious international terrorists are vying to acquire." Guest stars include Jennifer Dale, Deborah O'Dell, Michael Miranda, Jeff Camson and Noah Danby. "Wages of Sin" was written by Bob Carney and directed by Jorge Montesi. 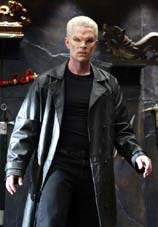 Click on the thumbnails above for fuller and larger images and look for more Mutant X news soon here in The Continuum. Marvel Enterprises and one-time Marvel Comics creator Joe Simon have announced that they have amicably settled their legal dispute surrounding Captain America. The specific terms of the settlement are confidential; however, the settlement included Simon's assignment to Marvel of any and all copyrights he has in Captain America. With the lawsuit settled, Marvel said it will focus its attention on aggressively building the Captain America property across a variety of mediums. This will include feature film and television deals, licensing/merchandising, promotional programs and new publishing initiatives. "Captain America ranks as one of the most recognizable super heroes in the world, who can stand quite firmly alongside Marvel's biggest name - Spider-Man," said Allen Lipson, Marvel Enterprises CEO. "Now, with the legal issue behind us, we can fully explore the deep value that this property brings to the Marvel Universe." Cartoon Network has provided The Continuum with story information about "Apprentice, Pt. 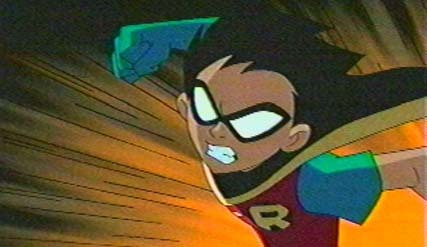 1," this Saturday's new episode of Teen Titans. "Who is Slade? And what is he planning? The questions that have been keeping Robin awake at night are about to be answered. Slade contacts the Teen Titans and unveils his master plan: A Chronoton Detonator -- a sinister-looking high-tech device that he claims has the ability to stop time... forever. The Titans spring into action on a mad hunt to find the Detonator before it freeze-frames the entire city. But furious Robin is so intent on foiling Slade's plot that his anger is taking control." Ron Perlman, who is starring in the Hellboy movie, provides the voice of Slade. Click on the thumbnails for larger views and look for more Teen Titans news soon here in The Continuum. Promoting the season premiere of Smallville, series star Tom Welling he has improved as actor over the first two seasons. "At the time, I had no experience and it was on-the-job training," Welling said Monday morning on ABC's The View. "They threw you in there, working 18 hours a day for nine months. I had a great cast around me, and a great production team, so they helped me out." Welling and Kristin Kreuk, who plays Lana Lang, were making the media rounds on Monday, two days before "Exile" kicks off the the third season. Kreuk, a native of Vancouver, made her first talk-show appearance on American national television Monday morning on Live with Regis and Kelly. * The WB has released story information for "Extinction," the Oct. 15 episode. "Clark discovers someone is hunting people affected by the kryptonite rocks and the killer�s next target is Lex. Clark uses his powers to save Lex, but is caught off guard when the killer learns his weakness and shoots him with a kryptonite bullet. 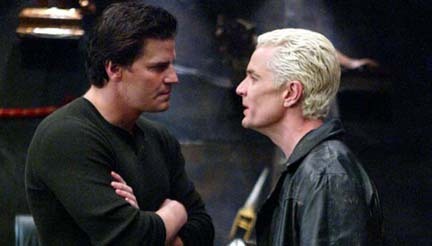 The episode was written by Todd Slavkin and Darren Swimmer and directed by Michael Kattleman. * The WB will show the first-season episode "Metamorphosis," on Sunday, Oct. 12 at 7 p.m. (ET). Marvel Comics has announced that artist Stuart Immonen has signed an exclusive creator agreement. Immonen last worked with Marvel on the Incredible Hulk story arc "Transfer of Power" with writer Bruce Jones (collected in the Incredible Hulk: Vol. 2 Hardcover, on sale in November). Immonen, whose next published work will be DC's Superman: Secret Identity limited series, will begin his exclusive Marvel tenure later this year. "Stuart is one of the finest illustrators and storytellers in comics as evidenced by his brilliant past accomplishments, especially his run on Hulk," said Marvel Editor-in-Chief Joe Quesada. "With his incredible dynamics, attention to detail and fan popularity, he was born to illustrate for Marvel and we're thrilled that he thought so as well." "I've long been a fan of Stuart's work, but never had the pleasure of working with him until his Hulk arc which, of course, he knocked out of the park," said Marvel executive and Hulk editor Axel Alonso. "A fantastic draftsman and storyteller, Stuart is the perfect fit for a new project that's in the works right now. The style he'll employ is sure to raise eyebrows among comic book fans as well as his fellow creators!" "The relationship I established with Axel and Bruce Jones on Hulk was the key factor in wanting to commit to a lengthy stay at Marvel," said Immonen. "A freelancer has to balance creative license with stability, and I feel that Marvel Comics and my new project will satisfy all my desires to challenge myself artistically, while the cushion of guaranteed work allows me to keep paying the bills. "The last time I signed an exclusive deal was 10 years ago, when I had a lot of energy to burn. I wanted to do a lot of different things. Now, I feel able to focus all that energy on one project, and contribute to something unique, put my personal stamp on and make a substantial contribution to one of Marvel's classic characters. "I've also been given free rein to do projects with Les Humano�des Associ�s for the European market, which is something I've been angling to do for a few years now. The coming months are going to be very exciting!" Archie Comics has released its solicitation information for January. According to Variety, Laeta Kalogridis has signed on to write a new version of the script for Wonder Woman, for producer Joel Silver, Leonard Goldberg and Warner Bros. Kalogridis developed the Birds of Prey television series. Here's a first look at the cover to Quantum: Rock of Ages, which launches in December from Dreamchilde Press. "Quantum reveals the story of Nick Vargas, a jaded musician turned record-store owner. Due to a Nazi experiment gone awry in an alternate reality, Nick is unwittingly taken on the ultimate search to find himself. In this case, Nick�s �self� has split into seven different characters over seven parallel universes. And two of them are women. His goal is to find his �cross-time� counterparts in order to repair time before time and space fade from existence. But on his journey, he encounters culture shock in the form of alternate possibilities in pop music and culture." Astonish Comics, owned by two-time Eisner Award winner Mike Kunkel, has joined with Blue Dream Studios, a 3-D animation studio owned by Scott Christian Sava. The new company, named The Astonish Factory, will be made up of four divisions: Astonish Comics, Astonish Books, Astonish Toys, and Astonish Studios. The first releases from The Astonish Factory are slated for December and will include: The Land of Sokmunster, Spike the Sokmunster (a 7-inch plush toy) and The Dreamland Chronicles. After selling out earlier this month, DC Comics' Batman: Hush Volume One HC is available again for reorder. Coming Tuesday: TV news -- and much more!! !